Home > 2016 > DARTSLIVE > Support Kumamoto earthquake relief efforts with DARTSLIVE THEME of KUMAMON! 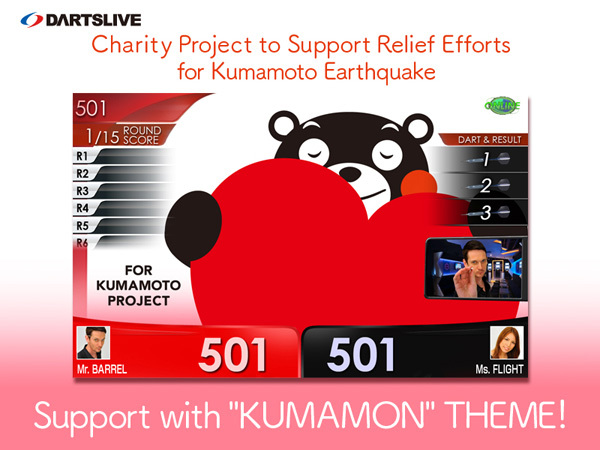 Support Kumamoto earthquake relief efforts with DARTSLIVE THEME of KUMAMON! DARTSLIVE co.‚ Ltd. offers its condolences to the victims who have lost friends and family in the 2016 Kumamoto Earthquake. We sincerely hope that the afflicted areas can realize a quick recovery. To support Kumamoto earthquake relief efforts‚ we have started a charity project using DARTSLIVE THEME of “FOR KUMAMOTO PROJECT” today. Let’s support the affected area of the Kumamoto earthquake by setting the charity THEME of KUMAMON‚ a mascot of Kumamoto prefecture! When you play with the players with this THEME on DARTSLIVE2‚ you will receive the THEME from them. DARTSLIVE will set aside JPY10 for the relief efforts every time the THEME is copied and all the money will be donated after the campaign. *This THEME will be distributed to DARTSLIVE OFFICIAL PLAYERS and LIVE QUEEN first. *The copy feature will stay after the period. We will make donations through the organization of KUMAMON’S DONATION BOX that operates FOR KUMAMOTO PROJECT.